This is a continuation from a previous article, but relevant in regards to the History Channel docudrama about to air on December 12th 2017. Undoubtedly they will continue to pursue suspect Lawrence Kane and attempt to provide a credible link between Lake Tahoe and San Francisco, which according to Detective Harvey Hines, Lawrence Kane had. He purportedly lived at 217 Eddy Street, San Francisco during the Paul Stine murder and worked for Alan Dorfman selling Arizona real estate at the Sahara Tahoe Hotel and Casino, the same hotel Donna Lass was employed. The likelihood of Lawrence Kane being the Zodiac Killer is down to opinion, however, as previously suggested, the link between Donna Lass, Lake Tahoe, San Francisco and the Zodiac Killer could be a very real one. A link inadvertently or otherwise, left by the killer when designing his 'Pines' card, mailed on March 22nd 1971. Many observers believe the 'Pines' card was crafted by a hoaxer, on account of the fact 'Victim 12' had already been claimed by the Zodiac Killer on June 26th 1970 when he mailed the 'Button' letter to the San Francisco Chronicle. On the contrary, this could go a long way to actually validating this correspondence. Bearing in mind the make-up of the 'Pines' card, it is extremely likely it is referring to the disappearance of Donna Lass. But in order for its author to have deliberately chosen the phrase 'Sought Victim 12' in reference to Donna Lass, we could assume he knew her previous employment and movements in the preceding few months, or just made a lucky guess when choosing this particular phrase. Would a hoaxer, having gone to all the effort of pasting up a card, then have made the basic error of getting the victim total incorrect. One could argue that the author of this card knew Donna Lass, knew that she had previously worked at the Letterman General Hospital and knew exactly when she had moved to South Lake Tahoe. Donna Lass left her job at the Letterman General Hospital and moved to South Lake Tahoe on June 6th 1970. Had he targeted Donna Lass before her move to the Sahara Tahoe Hotel? If so, then 'Sought Victim 12,' in its use of the past tense, could simply be implying that he had intended Donna Lass as a target before she moved from San Francisco. Harvey Hines stated in his 120 page report "Now we have the Zodiac running into the Presidio in the direction of Letterman General Hospital. The very place that Donna Lass worked. Also, in looking at the area map, I found that Lass lived six blocks south in the 4000 block of Balboa. That meant the Zodiac Killer started his ride near where Kane lived and ended it several blocks away where Donna Lass lived and worked. During the time she worked in San Francisco she lived at 4122 Balboa Street with a roommate named Carol Emerich. Emerich was also a nurse. According to the employment records, Lass was working a late night shift in October of 1969 when the San Francisco cab driver, Paul Stine, was killed by the Zodiac." If the killer knew Donna Lass, or indeed was familiar with the Presidio Park and Letterman General Hospital, then it is not beyond the realms of possibility he likely was familiar with this area and the advantages it provided as an escape route after the murder of Paul Stine on October 11th 1969. If the killer knew, worked with, or was familiar with Donna Lass during the short period she worked at the Letterman General Hospital, then clearly he may have sought her as victim 12 during this period. The Zodiac mailed the '13 Symbol' cipher on April 20th 1970 claiming 10 victims. On June 26th 1970 he was claiming 12 victims in the 'Button' letter. Therefore, he must have 'Sought Victim 12' between these two dates. The window of opportunity narrows when we consider that Donna Lass left for South Lake Tahoe on June 6th 1970. If the Zodiac Killer targeted Donna Lass while she worked and lived in San Francisco, it likely fell between April 20th 1970 and June 6th 1970. A window of just 46 days. Is this something a casual hoaxer would be aware of. Unless the employment records and movements of Donna Lass between these dates had been reported in the newspapers, was the choice of the 'Sought Victim 12' phrase just a lucky guess on behalf of the hoaxer, and just happened to fall correctly between these dates. 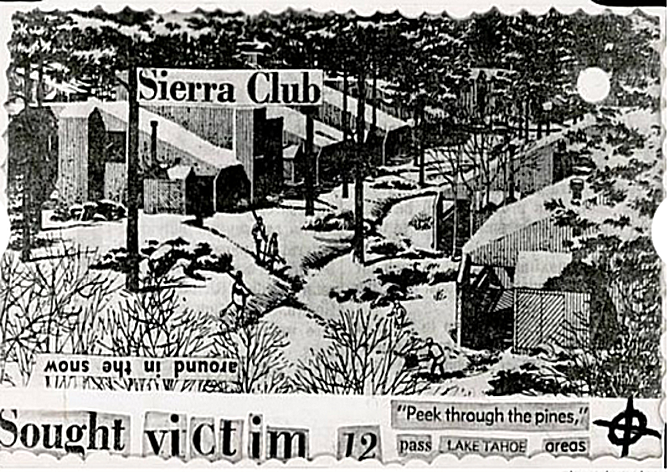 Did the author of the 'Pines' card do his research, or was Donna Lass specifically targeted by the Zodiac Killer, who moved or traveled to South Lake Tahoe with the sole purpose of completing his 'mission,' and the wording on the 'Pines' card was anything but a mistake. It may possibly dispel the preconception that the Zodiac Killer only targeted strangers, as has been alluded to in the case of Darlene Ferrin, murdered on July 4th 1969. Maybe the Zodiac Killer didn't care who he killed. It is astounding how many suspects there are in this case who seem entirely viable due to the circumstantial evidence surrounding them. Clearly they can't all be the Zodiac. I wonder if this has resulted from the eclectic nature of the Zodiac's correspondence? He also had a very average appearance. Basically any male in California at the time who wore glasses and was within a certain age group could be a contender. The Zodiac's correspondence is so open to interpretation that really we should not be surprised by the sheer number of suspects. Moreover we should not be surprised that the list of suspects will continue to grow over time. I have wondered about Kane on many occasions, but have never found him to be an entirely convincing suspect. As with Allen Leigh, some things seemed to fit while other things did not quite mesh. Perhaps the Zodiac was someone else who never was a suspect? Or he may have been one of the lesser suspects who were dismissed prematurely? Just like proponents of Ross Sullivan argue that he is the only suspect that can be connected the Riverside library, the same exact argument can be made for Lawrence Kane, if indeed Harvey Hines was correct, and Kane worked at the Sahara Tahoe Hotel. Similarly, Cheri Jo Bates and Donna Lass are widely touted as the best 'fringe suspects'. I don't believe Lawrence Kane to be Zodiac, but I always argue he is one of the best suspects in an altogether poor list. I think Ray, that a suspect wearing glasses, is actually a black mark against them being Zodiac, as I don't believe Zodiac wore glasses. Not one of the previous potential eight eyewitnesses ever recall any eyeglasses, and it may be the case that the Presidio Heights witnesses saw a Zodiac wearing Stine's glasses. I think too much emphasis is placed on having to line up a suspect wearing glasses alongside the sketch. It may be a blind alley. Agreed. I wonder if he was a man who sometimes wore glasses, other times didn't (perhaps he had contacts, perhaps not). He may have simply thrown those glasses on as he left the crime scene in case he did get spotted, and that would be enough to cause confusion and discrepancies in witness testimonies, thereby creating doubt. One day when I had some spare time on my hands I removed the glasses from the sketch of the person seen leaving the scene of the Stine murder. Without his glasses he looks rather different - slightly longer and slimmer in the face - and in fact he more closely resembles the drawings of the suspect from Lake Berryessa. The hairstyle is different, but that is actually a very minor detail. Anybody can change their hairstyle. All you need are scissors, a comb and possibly some dye. Rich you state: "Not one of the potential previous Eight eyewitnesses ever tecall any eyeglasses..."
Bryan Hartnell said The Hood had dark shadez/sunglasses affixed onto the hoods exterior covering the eye holes beneath. However, Bryan said he looked real close and when the light hit the eyeholes area he was able to see past the exterior sunshades and mentioned the hair hanging down over the mans forehead under the hood and also that He saw Glasses that he was wearing under the hood on his face. Bryan Hartnell stated: "And he had clip on sunglasses...it was hard to tell. You know, the sunglasses you clip on when you're wearing glasses, eyeglasses. He had those clipped on. I'm pretty sure...I don't think he had glasses, though. I just think he had these clipped onto his suit....you know, that little mask." Bryan Hartnell: "And I saw His Hair. It was Brown, it hung down across His forehead and was showing through the eye cut out's." "'Cause I saw it [his brown hair] from where the goggles fit... I looked so closely to find out. And when he turned you know they kind of flittered... I could see his hair. It looked kinda greasy." David Collins recollection of conversation he had with Cecelia Shepard: "And I asked her if she [Shepard] saw him [the Zodiac] clearly before he put the hood on and she said she did, and I said what did he look like, and she said well he...I said what color was his hair, she said it was brown. What race was he...he was white, and I said how about his eyes, could you see the color of his eyes and she said no he had dark glasses on underneath the hood. But she said his hair hung down across his forehead and was showing through the eye-holes"......David Collins (Retired Napa County Sheriff) speaking on 'This is the Zodiac Speaking' documentary in 2007 ..... "The information I am relaying to you now, is information I got directly from Cecelia Shepard. It is accurate for what she told me, because I kept notes and I immediately did a report the following morning." Yes, the murderer of Paul Stine could have subsequently looked at a map, but his descriptions such as "3 min after I left the cab", "the dogs never came with in 2 blocks of me","they were to the west," and "the motor cicles went by about 150 ft away going from south to north west," may appear to indicate good local knowledge of his spatial awareness within this area, and possibly somewhere he was all too familiar with. As Kim Rossmo alluded, this is the only known crime where he actually took the victim to the murder site, and therefore likely selected somewhere he knew well in the city, with a reasonable expectation of escape. Those that ''flirt'' with the case,all seem to have heard of Allen,as a suspect....which must be a testament to the legacy of Mr.Graysmith's contribution,to an extent [?]. I agree ''muchly'' with ''reasonable expectation of an escape'',for the Paul Stine murder. But,I suspect that ''they were to the west'',is a boast of someone's confidence in their orientation abilities. Someone,perhaps,who had done their homework,and ''cased the joint'',thoroughly [?]. A relative outsider,who took pride in his ability to acquire ''familiarisation'',and give the impression of being a local [?]. I had not seen those words,out of context,from Stine's claimed perpetrator. When you think about it,it is almost surprising that he did not give precise co-ordinates [?]. But,all things considered,we could have been reading about a mountain ranger,placed in an urban setting [?]. Agreed Rubislaw. We find this all the way through the Zodiac's correspondence. He often suggests an acute awareness of the world around him, but then gives us these kinds of extremely vague and general directions. We may also note in this regard the Phillip's road map - which is anything but an accurate and exactly to scale cartographic masterpiece - and then we have his vague and somewhat obscure mention of "radians along an inch", to which most people, including myself say "Huh?". Nothing is ever precise and any directions are in fact always very "general" in their scope. Yes it is very much like a mountain ranger would talk: "The fire was over that-a-ways to the west-south-west about a mile or so." It is amazing to consider that based on these kinds of vague ramblings from the Zodiac, Penn worked out a very convoluted theory which he claimed pinned down the Zodiac to an exact and very specific location and person, being the hapless and clueless Harvard lecturer Michael O'Hare. Yes,Ray...its surprising how often thoughts of ''geometry'' with the case,crop up. Being a ''super keen'' fan of motoring,that I believe Zodiac was....and coupled with his leanings to the navigation side of applied mathematics [?]. I must get down to re-reading Penn's ''17'' book,again...particularly,with Joan Webster's case file ''on loan''. Ms.Eve Carson,sister-in-law to Joan,struggled,for more than two years,to find where Essex County's D.A. had placed it.Even with her ability to afford good lawyers. She knows where it went,now. Sometimes ''these people'' [LE],are simply cruel and heartless...and,always ''so sure'',that they know best. Just thought that I would chip in with a mention of the ''Monticello'' card of July 13th 1971.....six months following the ''Pines'' card,March 22nd 1971. The Monticello card has never been released into the public domain.The FBI retain the original,and the SFPD are believed to have a copy,that The SF Chronicle handed over to them. Like the Pines card,it is believed to have a format of pasted print. The Monticello card is rumoured to mention pines,also.The text that we do know is : Near Monticello Shought Victim 21___In The Woods Dies April. The closest that anyone has come to,an influence,is the poem ''Agatha'' by Alfred Austin,which includes the line : ''She wanders in the April Woods''. What caught my attention was the word ''Shought''....clearly a deliberate misspelling of ''Sought''.....and may have suggested ''Shot'' [?]. In addition,there is the Benicia High School note of circa Autumn 1972,which contains the word ''Sould''...clearly,and in context,a misspelling of the word ''Should''. Sould,Should....Sought,Shought....also thoughts of ''infant talk'',and mispronunciation [?]. Man, this guy was clearly heavily influenced by the Riddler and Joker in the Batman TV series IMHO. And maybe Dr Seuss? Denise Kathleen Anderson (22), who resided in Sacramento, was last seen on April 13th 1971. It sounds an interesting card,as if a ''twin'',for the Pines card [?]. ''Twins'' could be a good research project....Leo/Cancer forecasts,another example. I think it was Ms.Betts,who first identified Monticello reservoir,close to Lake Berryessa. Of course no actual person called ''April'' turned up as a stiff. Maybe just a ruse from Zodiac,if authentic [? ].Naturally,the Pines card,also...in that he may not be responsible for the disappearance of Donna Lass. But,I suspect both cards are from Zodiac....giving rise to further clues,like the ''Riddler'' and ''Joker'' influences [?]. Interestingly,perhaps,the damn at Monticello,is known as ''Devil's Gate''. More ''diabolically'' damning evidence [?]. I often wonder about the possibility of double entendre with many of the things the Zodiac wrote about. A pun on "peek through the pines" could be "Peek through the puns". Or just by changing a letter you get "seek through the signs". And of course other pun jokes, like "I am pine, how are you?" I recall Richard suggesting in an earlier post that "around in the snow" could also mean " a round in the snow", as in shooting off a round in the snow. With Zodiac,we seem forever in ''pun paranoia''. Back to the Pines card...Richard's ''a round in the snow'' is probably closest to a deliberate pun,by Zodiac [?]. We observe a white hole depiction,top right hand corner,possibly representing a bullet hole. And,to be ''pedantic'',all the resort workers,are actually using long handled snow clearing shovels....that would not actually be of much use to dig a hole [? ]....apart from a very temporary one in the snow. From what we know of the Monticello card,it is similar to the Pines card....with ''both'' of them suggesting a ''ruse'' on Zodiac's actually involvement in a killing. That Zodiac was not responsible for the disappearance and probable murder of Donna Lass. We know there was no body at this location (punch hole) of Incline Village- I believe that would have been far too easy. Zodiac (if the author) placed 13 holes to depict 13 victims on the 'Pace' postcard. But on the Pines card the Zodiac isn't actually claiming any victims, just the premise of one. For this reason, the one punch hole was likely insinuating how he may have killed that person (probably Lass) and likely using one bullet, as in the case of David Faraday and Paul Stine. That's my best guess Rubislaw. One day while searching through Google books, I came across an entry in an old book that showed a striking resemblance to this theme. It mentioned punching holes in pine trees so someone can peek through the holes. I am not sure of the context. Sadly, it was one of those preview only books and the relevant page was blanked out. Yes Ray,and forgive me if I am wrong,but I assume we are pretty much in agreement on this....that the Pines Card is a ruse on an actually committed murder by Zodiac [?]. And that,with the Pines card,Zodiac ''used'' the inferred name of Donna Lass,as part of that ruse. Similarly,I believe,for the Monticello card.But...with this card,Zodiac had not been in a position to do any homework on a recent murder victim,that would suit the bill. Therefore,he actually stated an inferred name...which he called ''April''. Re-focusing on the Pines card.....and this being my opinion,is....that the ''thrust'',and main point of the Pines card is to alert LE to incriminating ''someone'' for the murder of Donna Lass. ''Someone'' who had connections with The Sierra Club. My personal feeling is that the card is entirely a ruse. Moreover it is a typical "Ned Kelly" style of taunt. He just wanted to let the authorities know that while they have been "missing him" he has been living it up elsewhere and having fun. I think if we say anything else about it, we are just making stuff up that might not be true. It does seem to be the case [....and anyone,do feel free to disagree...].that Zodiac was always looking at ways and opportunities to ''palm himself off'',as holder of the title ''The Zodiac''. If he,Zodiac,could succeed in incriminating someone else,for even just one murder....that even he,Zodiac,hadn't even committed,then ''all to the good'' for him,Zodiac. On a personal level,I believe that he,Zodiac,did actually have a specific individual,in mind...for incrimination. But I believe is important is,to establish that ''incrimination'' of someone,other than himself,was often the motivating factor,of much of his correspondence. Considering the Zodiac in all likelihood had an ego the size of Jupiter, I would not be surprised if he was content to imply or even overtly suggest that he was responsible for more deaths than he committed, to the point that he may have even fictionalized some of the accounts. The ongoing tally and the chain of taunting correspondence were perhaps just as important, if not more important, to him than the act of killing. Most certainly,Ray,that ''ego'' was nine tenths of whatever he was up to [?]. As you infer,the ''kills'' were more likely ,far less than he claimed. ''Pines'' to ''Monticello'',represented ''12'' to ''21''.....and in just a few months.Most unlikely. For Zodiac,the pen was mightier than the sword. Are we using the right description for the Zodiac, calling him a serial killer? Yes. As Wikipedia defines it: "A serial killer is typically a person who murders three or more people, usually in service of abnormal psychological gratification, with the murders taking place over more than a month and including a significant period of time between them." The logical deduction one is confronted with when examining the frustrating conflicting and confusing case of the Zodiac is that it has to have government cover up at some point in order to go unsolved for 50 years. And, if we can wrap our heads around that notion. Then the amount of overwhelming circumstantial evidence points to the mob-CIA fusion experimental MK-ULTRA or something along those lines as the reason for there being such discrepancy in the MO. and, witness descriptions. Government corruption is easier to believe than super-villain. It just does not look like the acts of a random crazy guy. These crimes are more like gang drive-bys. There was a great deal of planning involved to create the Zodiac. I personally think such conspiracy theories are in the same league as "It was the CIA who REALLY shot JFK", "Area 51 has aliens in their freezers", "Trump holds the secret keys to the lost 18 1/2 minutes of the Watergate tape", and "Princess Diana was actually murdered by the Queen!". Personally, as the Brits might say, I think such conspiracy theories are a load of old codswallop. This is just people trying to make sense of something when they cannot find or accept a simple and more rational answer by adding something totally non-provable to the mix. It is like they are trying to make a criminal event seem legendary and beyond the scope and understanding of other mere mortals. It is a common human malady to extrapolate such conspiracy theories in order to make sense of something shocking or complex, and frequently, over time, such theories become greatly embellished. It is not a logical deduction. It is actually a highly subjective and emotive form of reasoning. Please give me the CIA push back of "coincidence" then go back to sleep. Official Records show that Kane was born Lawrence Klein to Parents Morris H. Klein and Sarah Benjamin on April 29, 1924 in NY. The first time he changed his name was in 1946 - a bunch of murders took place that year with the same M.O. as the Zodiac.